there are so many things that i want so badly to tell you but i can't. That night Ingrid told Caitlin, I'll go wherever you go. But by dawn Ingrid, and her promise, were gone, and Caitlin was alone. Ingrid's suicide immobilizes Caitlin, leaving her unsure of her place in a new life she hardly recognizes. A life without the art, the laughter, the music, the joy that she shared with her best friend. But Ingrid left something behind. Devastating and hopeful, playful and hopeless. In words and drawings, Ingrid documented a painful farewell in her journal--just for Caitlin. Journeying through Ingrid's final days, Caitlin fights back through unspeakable loss to find renewed hope. A breakthrough new voice in fiction, Nina LaCour brings the changing seasons of Caitin's first year without Ingrid to the page with indelible emotion and honesty. I will admit that I picked up this book because I really liked the cover, but after I read it, I think it is an amazing story. This book was very similar to another book I read recently, Fall for Anything by Courtney Summers. Both main characters have to cope with a suicide of a loved one. Also, both books had photography in it, but I think I liked how photography was used in this one a lot better than I did in Fall for Anything. This book was excellent, it was real, deep, and emotional. I couldn't stop reading it, I had to keep going until I finished it. Caitlin is dealing with the suicide of her best friend, Ingrid, and is having trouble moving on. All she wants is to know why. When Caitlin finds Ingrid's journal, she becomes hopeful. She reads things she never knew about her best friend, and feels like she is the one to blame. Caitlin meets new people and makes more friends who help her with dealing with the loss of Ingrid. Photography and building also help her, and she knows she truly misses Ingrid, but she has to move on. Plot- The plot of this book and all other books that are similar to it always make me emotional when it deals with suicides. Basically everyone knows how painful it feels to deal with a loss of a loved one, but when the loved one kills themselves? You just don't know how to feel. Caitlin feels like she is to blame, that she never did anything to stop her friend, even when she saw signs of cutting and Ingrid hurting herself. I've never had to deal with the suicide of a friend or friends cutting themselves, but I can imagine how sad and helpless a friend can feel. I had trouble putting this book down, I just had to finish it as soon as I started it. I wanted more at the end, I needed more. I loved the plot of this novel, I don't think there was one slow moment in it. Characters- I liked the characters a lot. 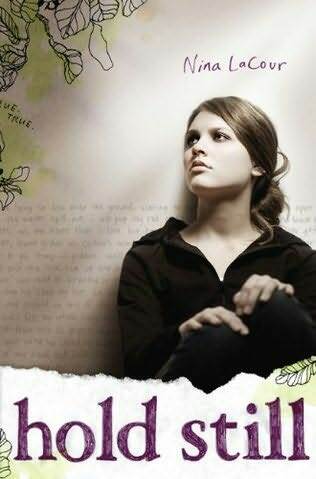 At the beginning, I didn't think Caitlin was my favorite character ever because of her depression and mopey attitude, but she changed during the book. Besides, I would be depressed also if my friend committed suicide, so it wasn't that big of a deal. I kind of felt that the characters were a little under-developed, I just wanted to learn a little bit more about them. Favorite Character- Taylor. He was so cute! I feel like I always pick the boy in the story, but I can't help it. I always like the cute boys! Least Favorite Character- Henry. There was nothing that interesting about him, I didn't really know much about him. Writing- This book has really beautiful writing from Nina LaCour. I can't wait to see more from her. I really loved the journal entries that were a part of this book. I always couldn't wait to read the next one. I enjoyed a lot of quotes from this novel, so I'll include a couple. Cover- As I said before, I was really interested in this book because of the cover. It is really pretty, with all the illustrations, and the faint writing on the wall behind the girl. I loved the font of the title, and also the color, because I love purple. You can just tell that this is going to be a sad book from the cover, because look at the girl! Doesn't she just look sad to you? I love this cover. Overall, absolutely loved this book. It was heartbreaking and real, a story about loss and sadness, but also the beginning of love and new friendship. 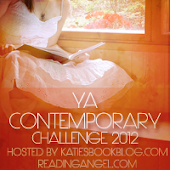 I recommend this to fans of Fall for Anything by Courtney Summers, or If I Stay by Gayle Forman. Also, any fans of YA Contemporary Fiction will probably enjoy this book. It has such a deep message, and I loved it. First Sentence: I watch drops of water fall from the ends of my hair. Violence- Deals with suicide of a friend. Nina LaCour grew up in San Francisco Bay Area. Her first job, at fourteen, was at an independent bookstore. She has tutored and taught in various places, from a juvenile hall to a private college. She now teaches English at an independent high school. Nina says, "Hold Still is about loss, but it's also about art. Throughout the book, even as Caitlin is struggling, she is finding joy in the creative process." Nina lives in Oakland, California. Hold Still is her first book. Now I really want to read this book. Somehow I thought it was her sister that died but being we best friend makes me wants to read it more! @mfay2 It was a really good book, you should definitely check it out!